specimen, especially in formal gardens. Rich green. Retains its globe shape without trimming. Good in full sun or light shade. Width: 3’ Foliage: Dk. Gr. Width: 2’ Foliage: Dk. Gr. green foliage color throughout Winter. Height: 10” Shape: Low, Spr. Compact growth needs little shearing. tinge in fall and winter. Very hardy. or bank planting. Likes to drape over walls! A very compact evergreen with bright green foliage. Will tolerate light shade and poor drainage. 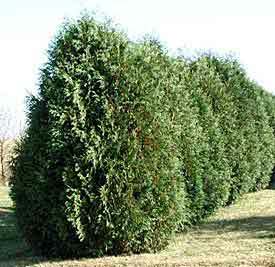 A fast growing , hardy, narrow cone shaped evergreen. Width: 6-8’ Foliage: Dk. Gr. foliage that holds its color in winter. more vigorous and oval shaped with age. best in full sun or light shade. A very slow growing, compact miniature spruce. Bright green foliage. Needs some protection. stems with a relatively low, semi-weeping habit. Retains its color best in full sun. really care for this plant. Full sun to part shade. or entryway, gate or path. Full sun to part shade. This plant produces loads of red cones in the spring. tendency to develop a leader. Same as St. Mary's Broom only on a standard. needles will create an unusual texture and specimen. in all seasons. Very hardy and rugged. spreader, with foliage that resembles arborvitae. Bronze winter color. Shade tolerant. A slow spreading globe. Requires minimum trimming. burn. A superior spreading type. Dense, slow grower, with rich dark green foliage. Full sun to heavy shade. 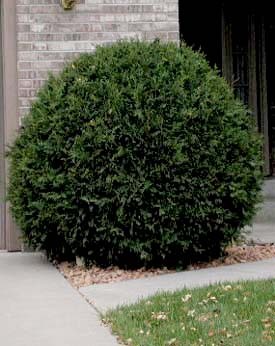 Can be used as a 8-10' trimmed hedge.